Have the Viking experience! See the wonderful stabilization work that has been done. Walk up the ramp to the viewing platform and see inside. You’ll have lots of fun. Come on a scheduled Saturday. Docent led tours begin every 30 minutes. 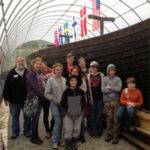 Our volunteer docents will tell you all about this “one of a kind” ship. 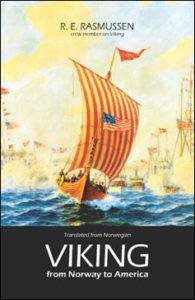 You’ll learn of Viking’s construction, journey, and significance. You may even meet a Viking! 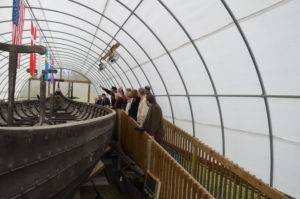 The Viking ship exhibit is usually open between 1 and 4 PM on the third Saturday of the month and additional scheduled dates April through November. See all of our 2019 Open Days! 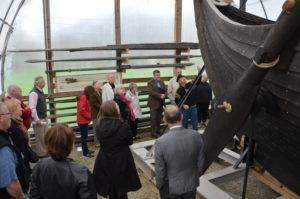 Are you interested in bringing a group on a tour of the Viking ship? Send us an email for more information. Two week lead time required. $50 minimum fee. Good Templar Park is a private park. We request a lead-time of at least two weeks in order to check for the availability of the park and to schedule volunteer docents. “They covered the entire story! I knew the class would enjoy this visit, but it was even better than any had anticipated… all truly enjoyed the visit and seeing this amazing piece of history. Our questions were answered with patience and an incredible depth of knowledge.” said Rosalie Dixler, Coordinator of the “Around The Neighborhood” class from the Lifelong Learning Institute at National-Louis University after taking her class on a group tour of the 1893 Viking ship.